This aerial photo was taken in 2016. The state considers the Mosaic site to be in an “emergency condition.” The agency began alerting parish authorities and a handful of nearby residents on or shortly after Jan. 25, according to Greg Langley, press secretary with LDEQ. Langley said LDEQ initially took the lead in the emergency response while EPA offices were closed as a result of the recent federal government shutdown. The Lens requested access to meetings between EPA and LDEQ officials and Mosaic officials, but company representatives said the meetings were not open to the public. 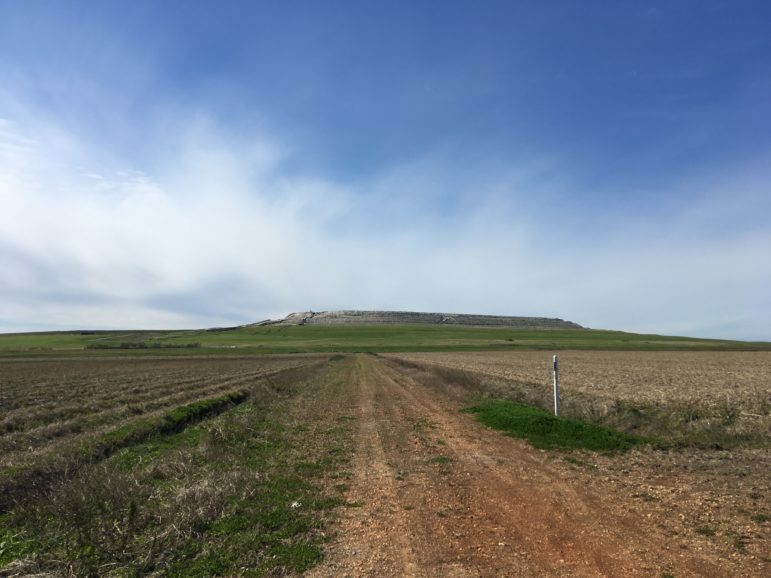 “They’re looking at the site, looking at where we’re draining water off the stack,” said Russell Schweiss, Mosaic’s vice-president of public affairs for land management and mine permitting, in a brief interview at the plant. LDEQ and the company said that, because of the location of the problem, there’s little chance of the wastewater entering the Mississippi River. “There shouldn’t be any contamination of the Mississippi River of some of those materials, or it should be sufficiently treated prior to discharge,” Dr. Brady Skaggs, water quality program director for the Lake Pontchartrain Basin Foundation told The Lens. A greater concern than Mississippi River contamination is a potential flow into waterways to the north and east of the gypsum pile. Canals and the Blind River lie in that direction. Skaggs said the acidity of the process water makes it particularly hazardous to people, animals and vegetation in its path, should the retaining walls collapse. Officials from LDEQ and Mosaic said the company is constructing a buttress on the vulnerable north slope of Gypsum Stack No. 4, as the company refers to the failing waste pile containing the reservoir. Residents meet at a town hall meeting in Vacherie Tuesday. Assurances that the company and state officials are handling the situation offered little relief to some residents, who voiced concerns at a town hall meeting Tuesday evening in Vacherie. The small St. James Parish town sits across the Mississippi River from the fertilizer plant. 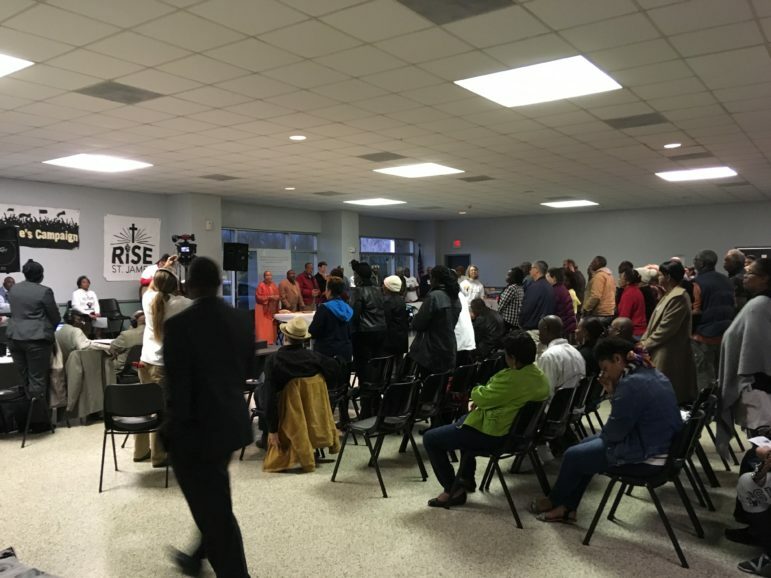 The meeting, promoted as a “Cancer Alley revival” by a national advocacy group called the Poor People’s Campaign, drew more than 200 people. Speakers drew attention to impoverished living conditions in St. James Parish, home to a range of petrochemical plants and other industries such as Mosaic Fertilizers. Phosphogypsum is a form of gypsum, a mineral commonly used in plaster products. 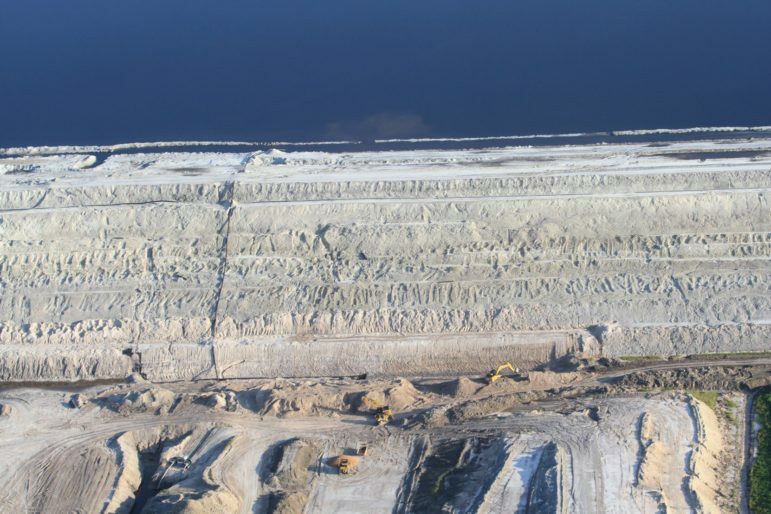 “Sulfuric acid is used to extract phosphorus from mined rock, which produces large quantities of a solid material called phosphogypsum and wastewater that contains high levels of acid,” reads the EPA settlement document. A separate EPA report notes that phosphogypsum emits radon, a radioactive gas, and also contains naturally occurring “radionuclides” such as uranium and radium. The EPA referred Mosaic Fertilizers to the Justice Department in 2006, after finding that the company was violating the federal Resource Conservation and Recovery Act at its two plants in Louisiana and six plants in Florida. That law regulates how hazardous waste is stored, handled and disposed. The action eventually led to the 2015 consent decree, which requires Mosaic to pay for the “future closures of and treatment of hazardous wastewater at four Mosaic facilities” — including the Uncle Sam plant — and further reduce the environmental impact of its manufacturing and waste management programs. Callie Neslund, Mosaic’s public affairs director, explained that the funds would be used for the eventual closure of the Uncle Sam plant, though it is not slated for closure at this time. 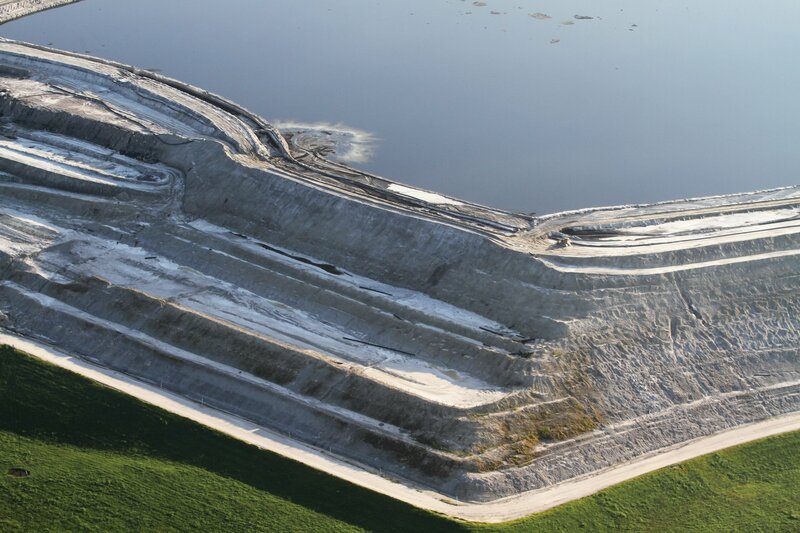 An aerial photo of Mosaic’s Gypsum Stack No. 4 from 2016. “The 60 billion pounds of hazardous waste addressed in this case is the largest amount ever covered by a federal or state RCRA settlement and will ensure that wastewater at Mosaic’s facilities is properly managed and does not pose a threat to groundwater resources,” read a 2015 EPA news release, after the consent decree was finalized. The government alleged that Mosaic failed to properly treat, store and dispose of that waste. “EPA inspections revealed that Mosaic was mixing certain types of highly-corrosive substances from its fertilizer operations, which qualify as hazardous waste, with the phosphogypsum and wastewater from mineral processing, which is a violation of federal and state hazardous waste laws,” the agency said in its statement. A review of EPA records found that Mosaic remains listed as a “significant noncomplier” with the RCRA as a result of the federal court action. A bulge in some neighboring farmland is what first raised the alarm at Mosaic. The company initially alerted state and federal authorities in a Jan. 10 letter to LDEQ and EPA, issuing a “Condition Critical Notice” in compliance with the consent decree. Buttressing the slope, against the bottom portion of the levee, is expected to act as a counterweight to that uplift. Workers were spotted Wednesday on the north slope, working on that buttress. A westward view of the phosphogypsum stack, rising about 200 feet high over neighboring cane fields. Asked why the wall started to move, Neslund told us a “shear plane” — essentially, uneven soil caused by compression — had been identified about 95 feet below the natural ground. LDEQ indicated it too would look further into causes after the situation at the pile has stabilized. Mosaic crews are pumping about 10 million to 20 million gallons of water a day out of Stack No. 4 and into other ponds at the Uncle Sam site. “They’re bringing it down at a rate now to where we expect it will probably, within a week or two… [move] a 100 million gallons off it,” Schweiss said Wednesday. LDEQ said this particular stack of phosphogypsum was originally built in 1993. It spans about 139 acres, is 30 to 40 feet deep and could hold as much as 1 billion gallons. Langley said this manner of storing such a large amount of wastewater is compliant with the 2015 consent decree. He said heavy rains recently added to the reservoir and the weight of water pressing down on the earth underneath. Skaggs, from the Lake Pontchartrain Basin Foundation, said stormwater itself becomes contaminated when it comes in contact with such wastewater.